Who says you have to go to Savile Row to get a one-of-a-kind world class shirt? Fortunately for us, there’s the iconic Hamilton Shirts in Houston. Finding a great piece of custom clothing is like a fine wine – it gets better with age. Hamilton Shirts is just such a place. Founded in 1883, it is still a family run business with 4th generation owners. It’s a great testament that classic never goes out of style. We recently made the quick jaunt to get a custom fitting and it was a five-star experience all the way. 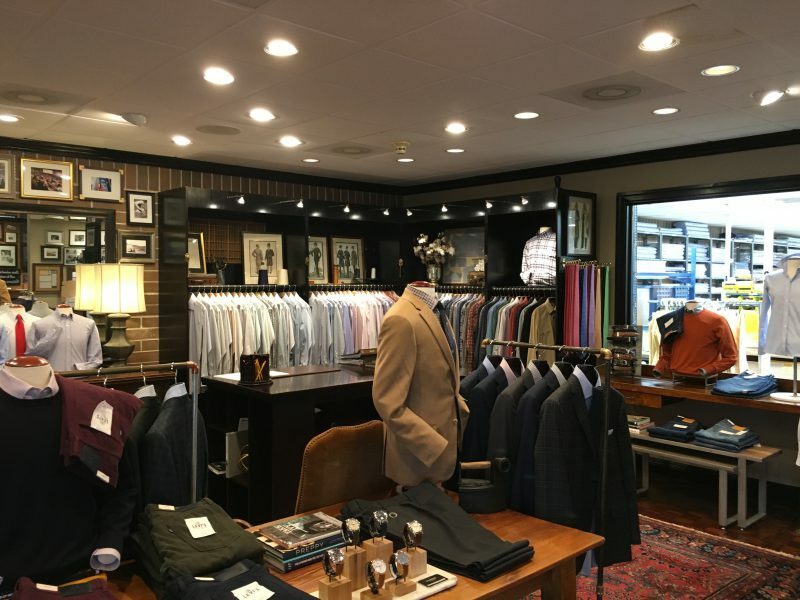 Upon walking into Hamilton, you feel as though you could be stepping into the finest menswear shop in New York or London. The dark, wooded walls surround the picture window that peers into the tailoring team who make all of the shirts on-site and by hand, a true throwback of sartorial style. Sarah was the knowledgeable person on Hamilton’s staff that day to expertly take me through the process of obtaining one of the world’s best fitting shirts. I learned that Hamilton is one of only three shirt manufacturers in the world that does not fuse collars and cuffs with glue to keep them together. Instead they utilize fabric lining. Why is this a big difference? Ask anyone who has gained a few pounds and experienced a tight neck around the collar. The fabric lining allows the shirt to better adjust to your body and as a result maintaining a comfortable fit. After touring and sampling through the over 500 fabrics available, I decided to select a crisp white tuxedo shirt. At this point does Sarah place my information in the computer? No...she instead takes me through the work space and into a side room where there are individual files are kept of each and every Hamilton client before me – the very same filing system used since its inception and the ultimate in retro cool. After the tour, we begin the fitting process. I am given a sample shirt for sizing that I change into in one of the private dressing rooms. As my many measurements are noted on my own individual file, the process was a breeze. I’m not partial to monograms, yet after some convincing by Sarah, I placed the monogram on the back collar in an inconspicuous spot. After completing my fitting, I was told my shirt would be available in three to four weeks and that expediting is available as well if you are in a pinch (example: you’re getting married this weekend and forgot to order a new shirt). I received my shirt in a little over three weeks after my fitting and had the opportunity to sport it later the same week at a gala for Fashion Guild International in Dallas. The shirt fit me like a glove and was incredibly comfortable around the neck and will be my go-to-tuxedo shirt for many years to come. There’s no doubt I’ll be back to visit the good folks at Hamilton again soon because just one tailor-made shirt may not be enough.